Just for community interest... 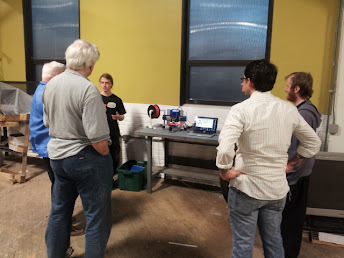 I first saw an ORD Bot when a guy came by Make Lehigh Valley, a hackerspace in which I'm a member. His name was Jeremy and he was checking out engineering schools near hackerspaces and planned to make the hackerspaces an important part of his decision. Brilliant! I assume he didn't end up near us as I haven't seen him since. (Where are you Jeremy?) Anyway, I was impressed and have had it in the back of my mind for awhile. I deviated for awhile looking fondly at the SeeMeCNC RostockMax, but I have returned and now invested in parts. Quality and appearance are probably the top two priorities I have for this printer. Ease of assembly and flexibility for future improvements are secondary priorities (as I'd like to get printing before very long and I'd like to be able to improve it). Then price is the third priority. I've updated this since writing some of the other things here so there are some minor inconsistencies. The list is the most up-to-date. I've made links to where you can purchase each item on the item name and where applicable the reprap.org wiki page as that seems to be the best location for technical data on each part. Also, I don't recommend getting extra bits from Panucatt. They may not make it into the box. Wire: scavanged from various locations, especially some old power supply mods. I chose Panucatt for their reputation on the forums, my personal interaction with Roy (the owner) and the nice finished look of the board. I chose ATI because of their reputation on the forums and because I wanted the experience of assembling the mechanical platform, but not confident in machining it. Extruder is still TBD - I'll probably try to scavange a stepper, springs, bolts, etc. and arrange prints for much of this. I'm considering the purchase the J-Head hotend I might try to put Steve's Bowden onto the bot and machine a custom carriage for it, hiding the stepper and gears back with the controller. I'd also like to mount the tip of the hotend as high as possible to give me lots of height for my prints. I'm very open to thoughts on this so feel free to add your ideas and opinions in the forum post I started on this. In the end, indecision will probably force me to duct tape a sharpie to the extruder carriage for initial tests of the controller board. Last edited by flickerfly on Wed Jun 05, 2013 12:30 pm, edited 4 times in total. QUBD Nema17 and 12V heater cart equipped MBE extruder $70 shipped, PTFE teflon tube for nozzle ($2 if you want some), Barts MK7 gear and his tensioner system $25, = sweet 1.75mm low profile solution. You will drill the barrel for the teflon tube, get rid of the QUBD tension pin and their uhmw block, install the Bart mods and it is super awesome IMO. Strike that, I figured out what you're talking about and made another comment further down with a question. Last edited by flickerfly on Mon May 06, 2013 2:47 am, edited 3 times in total. I'm glad you're finally starting a printer. I'll be following along. Thanks Jeremy! Feel free to share your advice any time. I've used that picture I attached for advertising the hackerspace because I can point out the diversity of the hackerspace in terms of age and occupation. We have retired college prof learning from a high schooler while an economic development professional, a blender artist and an electronics wizard listen in. Then there is me, a sysadmin, behind the camera thinking about how cool Jeremy had it to grow up around a machine shop. Something I haven't mentioned yet, but will probably show up in the pictures later. My 6yr old daughter and I have been saving up for this printer for awhile now. She's really excited. She sat in my lap this afternoon as I shared with her what I'd ordered and how things were going to go together this afternoon. What a great Daddy/Daughter activity, assembling a 3D printer together! Maybe in a couple years my son and I can assemble a laser cutter. He's only 2yr old now so not quite catching the vision although he does like the "train tracks" and "wheels" of the ORD Bot so that's a plus. That brings up another thing I need to figure out. I need to make sure that when this thing is printing, they can watch but not touch the hot parts. I can probably train the older two, but there is also my 9mo old daughter. I may build an acrylic fence for it or something similar as I do want them to see it in action. I'm thinking a 3D printer in the house may just be like my Dad having Internet access in our house and bringing home Linux from the faster connection at work from when I was very young, giving me skills to be at the forefront of cultural change and having skills that are valuable within that context. bloomingtonmike wrote: QUBD Nema17 and 12V heater cart equipped MBE extruder $70 shipped, PTFE teflon tube for nozzle ($2 if you want some), Barts MK7 gear and his tensioner system $25, = sweet 1.75mm low profile solution. You will drill the barrel for the teflon tube, get rid of the QUBD tension pin and their uhmw block, install the Bart mods and it is super awesome IMO. Okay, I think I've read up enough to catch what you're saying here. You're suggesting that purchasing the QUBD with a heater cartridge and applying the modifications to make it reliable is the way to go, right. My big issue is the drilling of the nozzle. I don't have any experience with machining parts. I've done some home remodeling, a touch of wood working and took a shop class with some welding in it in high school. I also don't have easy access to a drill press with a vise. How likely am I to irrevocably mess my nozzle up? I don't think he meant to drill out the nozzle, but rather the stainless thermal barrier. Did you guys ever get that lathe set up? That would be the ideal way to do it. The short answer is no. The long one involves lots of paperwork and boring details about liability, training and not letting people wrap their arms around the lathe. We have made progress though. Oh... My mechanical platform is here. ATI was quick about it. I'm not going to open it until I'm done working. It is enough of a distraction already. The ATI kit came with the V-Wheels and the Idlers pre-assembled. I sorted all the items. I think I have a problem where the motor brackets were in a bag labeled #17 which is actually the M5 x 6mm Button Head Cap Screws and I didn't get those screws in the box. I can totally see that getting past the double check. Packing was good and all the parts looks to be nice, straight and a consistent blue color where appropriate. The extrusions are all properly sized. Update: this was my error I was using the wrong list - The ATI shipping list. I guess I'm going to put tons of images on a Google+ album. Here are some highlights from tonight. Last edited by flickerfly on Thu May 09, 2013 8:08 pm, edited 1 time in total.